1:10,000 scale (1.25 vertical exaggeration) 3D model of the eastern portion of the Pu Mat National Park, Nghe An Province, Vietnam completed in November 2001 as the first P3DM ever done in Vietnam. 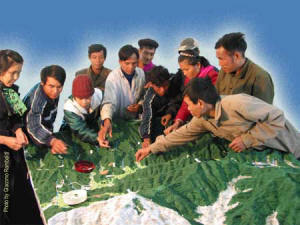 The model, covering a total area of (700 km2) includes core and buffer zones of the national park. Depicted data reflect the cognitive maps of 76 men and women (few) from ethnic minority groups including Dan Lai, Thai and Kinh from the following Communes: Mon Son, Luc Da, Yen Khe, Chau Khe, Chi Khe and Tam Hop. Additional contributions have been made by and 6 park rangers and 10 SFNC project staff. “Giving Voice to the Unspoken“: a 20-minute video production showing the hands-on aspects of Participatory 3D Modelling (P3DM). 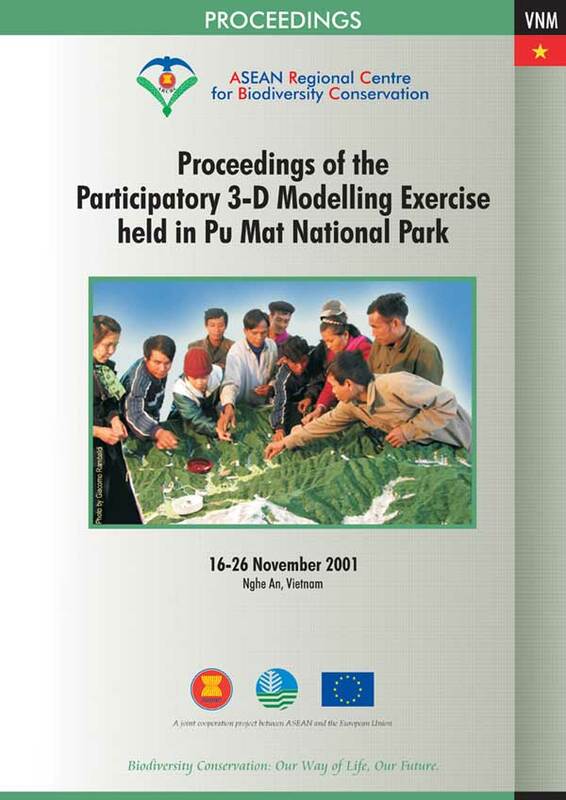 This video supports all practical aspects of P3DM described in the resource book “Participatory 3-Dimensional Modelling: Guiding Principles and Applications” and documents in detail an exercise conducted within the Pu Mat National Park, a protected area in Vietnam. This documentary is a co-production of the ASEAN Regional Centre for Biodiversity Conservation (ARCBC), the Social Forestry Conservation Project in Nghe An Province – Vietnam, the Environmental Broadcast Circle (EBC) – Philippines affiliated to the International Television Trust for the Environment (TVE). _______. 2001. Profile of the Protected Area.